Wind shear is a nasty thing and in this case the wind shear is still affecting a storm in the Philippine Sea. NASA-NOAA's Suomi NPP satellite and NASA's Aqua satellite imagery showed wind shear was still affecting Tropical Storm Saola.as it moved through the Philippine Sea. 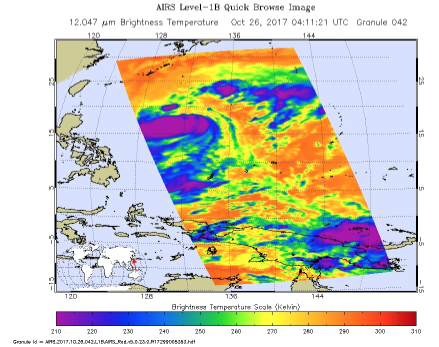 On Oct. 26 at 12:11 a.m. EDT (0411 UTC), the Atmospheric Infrared Sounder or AIRS instrument aboard NASA's Aqua satellite provided infrared data on Tropical Storm Saola. Coldest temperatures indicated cloud tops as cold as minus 63 Fahrenheit (minus 53 Celsius) were mostly south of the center. On Oct. 26 at 12:18 a.m. EDT (04:18 UTC) the VIIRS instrument aboard NASA-NOAA's Suomi NPP satellite provided a visible image of the storm. The image showed the bulk of clouds were on the southern and western sides of the storm indicating the storm was still being affected by vertical wind shear. 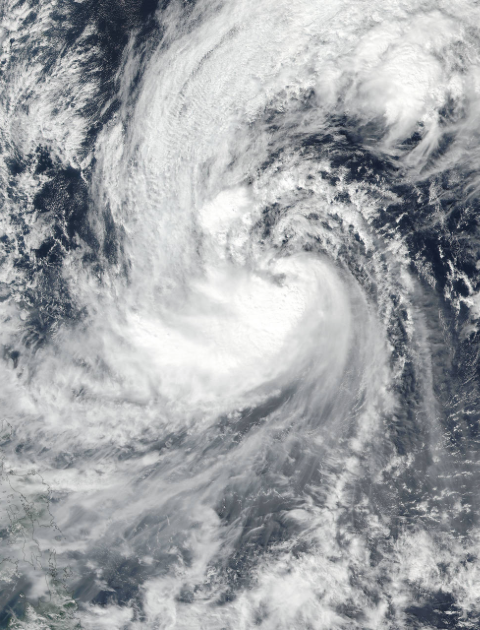 At 11 a.m. EDT (1500 UTC) Tropical Storm Saola was centered near 19.4 degrees north latitude and 131.2 degrees east longitude, about 466 nautical miles south-southeast of Kadena Air Base, Okinawa Island, Japan. For information about Kadena precautions, visit. Saola was moving to the northwest 12 knots (13.8 mph/22.2 kph) and had maximum sustained winds near 45 knots (52 mph/83 kph). The Joint Typhoon Warning Center noted that Saola is moving northwest and will slowly curve toward the northeast while strengthening into typhoon.